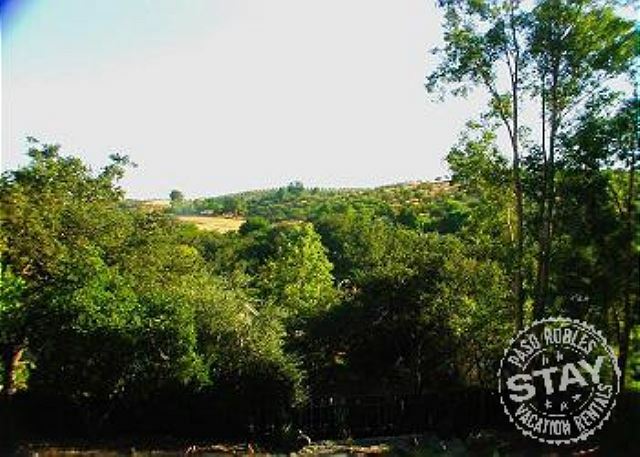 The Serendipity House is snuggled in the wooded hillside of West Paso Robles just minutes to several wineries and less than a mile to downtown Paso Robles. Accomodations that can provide this level of seclusion are rare, but it's exactly what you get with this rental. Serendipity begins when you enter the front iron gate and are greeted by 35 foot tall Birch trees and lush landscaping. One of the outstanding features is the panoramic views of the rolling hillside from the 600 sq. ft. deck; a great for spot to relax with a glass of wine, dinner and cherished time with friends and family. The Serendipity House has a comfortable family room with hillside views and an extended “flex” living room creating multiple seating areas. The gourmet's kitchen features commercial style stainless steel gas cooktop, 30" oven and convection microwave. 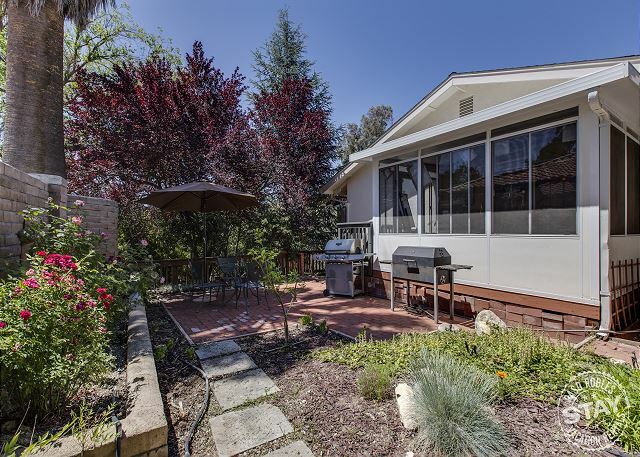 Outside amenities include 2 dining areas and a full gas grill and a wood smoker/grill located on the east patio. A walk to town is approximately 8 – 10 minutes and is a downhill stroll. I’d suggest perhaps a morning stroll to town for exercise and enjoy the 2 minute drive to town in the evening for great dinner options, wine tasting rooms and live entertainment! Off-street parking available in driveway. **Garage is not available to guests. Perfect get-away--both accommodations & location!! Perfect Paso Place for vacation! We really liked this house! 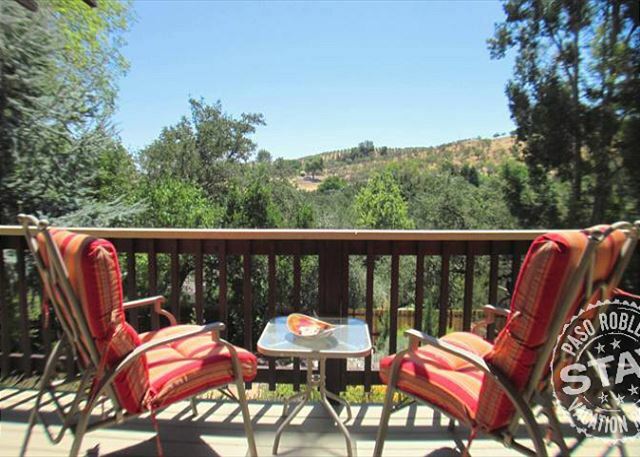 It was in a beautiful quiet neighborhood on a hilltop with gorgeous views from the back deck. It was located close to many of the wineries. The house was roomy, well furnished for 4 adults. The kitchen had everything we needed to cook a few meals. The beds were all comfy. We stayed at the Serendipity House in Paso last month. The only negative thing I can say it is rained so we were not able to enjoy the patio as much as we would have liked. The house has a great layout. Four of us could be in the kitchen without tripping over each other. The beds were all very comfortable and the house was spotless. This was a FABULOUS stay. So sorry took so long to respond. We liked it so much we will stay again next month with a different group of friends. The kitchen is rather small, but we bring our meals pretty much pre made anyway. Very nice grounds...great weather when we were there, so had all of our meals on the very ample deck. - cindy d.
We stayed 4 nights at this house with another couple. The neighborhood was extremely quiet, with the only real noise the occasional rooster in the morning. The most we saw of other living creatures were the deer, which were quite plentiful. The house was very neat and clean with more than enough space for 2 couples. Another 2 adults would be easily accommodated. The deck is mostly west facing, making for a pleasant way to spend the evening watching the sun set over the hills. The house is located near the top of a development that is just a few minutes from US 101. 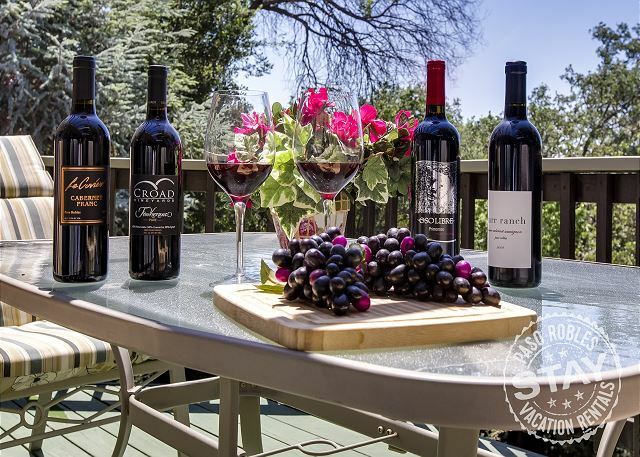 As such it is close to downtown Paso Robles, shopping and wineries. If you plan any travel in the area, I would strongly recommend having a vehicle, as there is little within an easy walking distance. The house was perfect for the three of us. The sitting area's were spacious and very comfortable. We loved the patio too. Our stay at Serendipity was perfect for our party of four (one couple and two singles). The house was spacious and provided plenty of room for our 3 night stay. It was clean and the kitchen was stocked with the essential cookware & tools as well as coffee, powdered creamer, pancake syrup, spices, and some other misc pantry items. One never knows exactly what is supplied so we brought all of our own spices, coffee, etc. The neighborhood was quiet and we had no issues. The only negative is the steep sloped driveway. This was a minor issue for us as we had someone physically handicapped in our group. It was only slightly challenging and we managed. It would not, however, prevent us from returning to this property. Amazing, can't beat this deal! My husband and I rented the house for the weekend along with 2 other couples. We had an amazing time, it is very close to downtown. The views are beautiful, not to mention how organized everything was in this house. The kitchen was stocked with every ammenity you can think of so we had unlimited options when deciding to cook breakfast. We ate dinner on the outside patio which was perfect because the sunset view was gorgeous. We will be back!! - Joanna L.
Stay over weekend between business trips. We used the house as our base for a three day weekend. An excellent experience. The home is somewhat dated but the kitchen and the deck view are wonderful. So if you like to cook this is a great place. It's a very fair price for the value. Moments away from the Planet Fittness where we worked out each morning. Close to the Catholic Church for mass. Wineries within fifteen minutes. Everything in the place is labeled for you so you can't screw it up. It was exactly as it was represented on the web site. Nothing is 100% and the shower in one of the bedrooms was in need of repair. We called it in but it did not get fixed....but hey we were flexible and I will come back. Two couples spent four days at Serendipity. We've stayed in over ten different rental properties over the past five years. This was one of the top two, and we've stayed in some really good places. Great kitchen; we prepared all but two meals here. Well stocked. No need to bring anything. I was astounded...the knives were sharp and the non-stick pans and pots were not all scratched up (we always bring our own skillet and knives based on experience; not necessary here). Bedrooms were large, comfortable and with plenty of storage space. Bathrooms clean and roomy. We're looking forward to our next trip to Paso, hopefully next time with three couples; we'll stay here if it's available. PS 1: The towel issue noted in previous reviews is no longer an issue. PS 2: The owner was very responsive to texts over the course of the weekend. Perfect for our 3-4 guests. Enjoyed the lovely deck and felt like we were in the country! The neighbors waved and always friendly. Kitchen setup was perfect for chatting and cooking at the same time. Comfy beds and easy access to downtown and the highway. Great place to stay in Paso Robles! We loved Serendipity and hope to return on our next vacation. The house was lovely, well-equipped, and immaculate. I would like to add that the owner of the home was very gracious and went the extra mile for us. We arrived at the Serendipity house on an early Friday evening. There were a total of six of us in our group. Upon entering, the first thing we noticed is how nicely decorated it is. There is really a personal touch you can feel with this house, immediately. The deck out back is perfect for sipping wine, coffee or whatever else you fancy. A few of us chose to take our evening happy hour out there while some of us preferred to stay huddled near the fireplace. Speaking of the fireplace, the living room is super comfortable and spacious. It easily accomodated six of adults with room to spare. The bedrooms are also generously sized. The beds are super easy to sleep in, especially after a day of wine tasting. Serendipity a great place to stay! A taste of wine country. Beautiful home with the perfect location! House was clean and in a oood location, close to downtown. I can say I don't have a complaint about the house at all. The owner is very respectful and open to communication, the location is right where you need it to be. I felt like HomeAway could've been updated by the owner of mgmt company to more visibly include the cleaning fee(s) up front. My own personal taste would've probably included a Jacuzzi up on that beautiful Deck, but I'm a Jacuzzi guy. :) The kitchen is well decked out and gorgeous. Easy to work in. Wonderful stay. Loved the home and want to thank Wayne for helping get organized with the fireplace. We would love to stay at the home again.